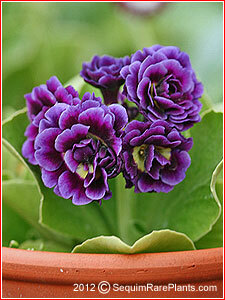 Auricula primroses have thick, fleshy leaves that are evergreen. They can take severe winter cold, surviving well to −35 to −40°F, with protection such as snow cover. When grown where summers are especially warm, they need a bit of shade during the hottest part of the afternoon. 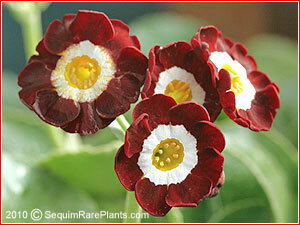 $8.95 Richly reddish flowers with lighter edges to her petals. The petals are beautifully rounded. 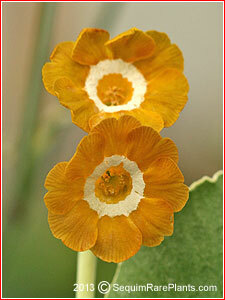 And the center eye of a flower is a rich gold. 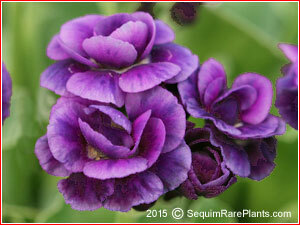 $8.95 A double flower in reddish-purple, it was selected and named by Linda Tinnity and Jim Fox. Vigorous, thriving in Alaska without protection. 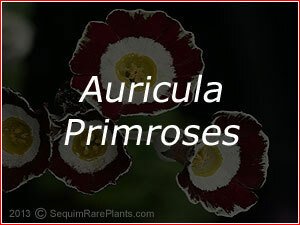 $8.95 Dark red petals that are a lighter pinkish-red at their edges, 'Argus' is an old primrose that was selected and named in 1897, over one hundred years ago. The eye in the center is a light, cream. 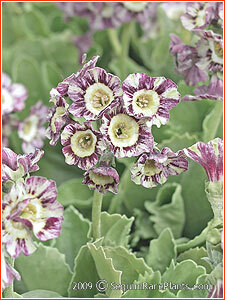 $10.95 Arundel' has multi-colored flowers of reddish coloring and creamy green. 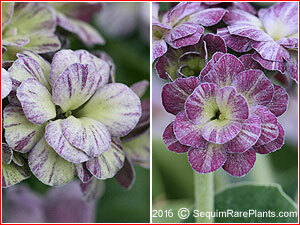 Sometimes its name is given as, 'Arundel Stripe.' This is a very vigorous plant. 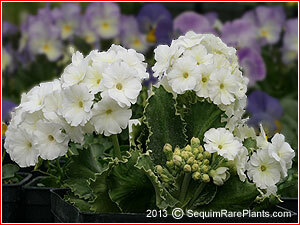 $9.95 Frilly-edged, white petals are often semi-double, although they can also be single. 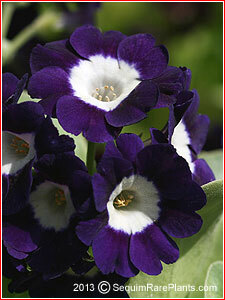 $10.95 The petals are large, and a dark blue-purple, encircling a well formed white eye. The plant is compact and vigorous. This plant was first grown by Barbara Weinz of West Bath, Maine, who grew it from seeds acquired from Herb Dickson. 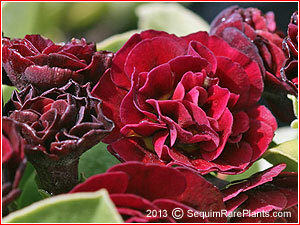 $10.95 A single row of petals in a very dark red, bordering on black. We have Cheri Fluck of Sherwood, Oregon to thank for sharing this beauty with us. $10.95 'Brazil' is colored a rich tawny yellow. 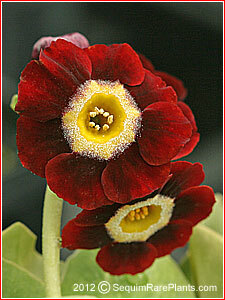 It is a vigorous show auricula bred by the British nurseryman, Derek Telford. $12.95 Reddish-brown shaded to light beige with a gold center. $11.95 The petals are heavily dusted in powdery meal. They are a grayish green with a blaze of black at their bases, creating a circle of inky blackness surrounding an inner circle of white and a yellowish eye. The white circle ages to a similar color as the eye. Grown by Cyrus Happy. 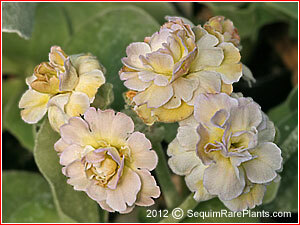 Classified as a gray-edged show auricula. $8.95 A rich red, slightly lightening at the edges. A vigorous grower. 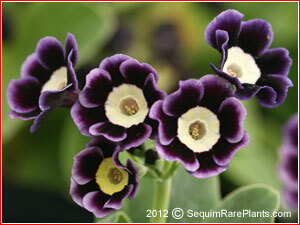 $8.95 'Doublet' has double flowers with rich purple petals. 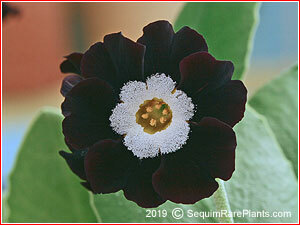 $9.95 A self of very dark red petals that are near to black. 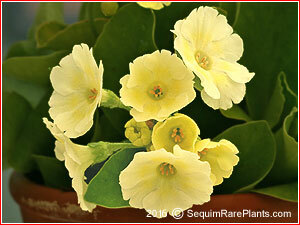 $9.95 Double flowers with creamy petals of very light pink and very light yellow. 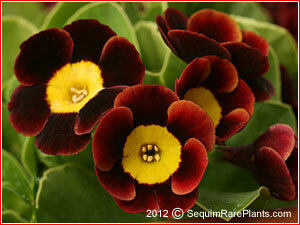 $10.95 Light, tannish brown petals. 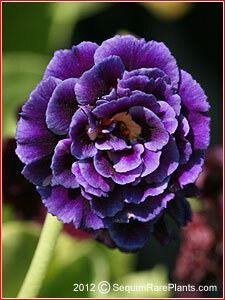 $8.95 Multi-petalled double flowers of bluish purple. 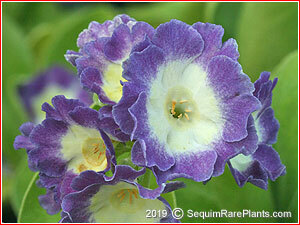 British nurseries describe the color of this flower as French blue. Bred by Derek Salt. 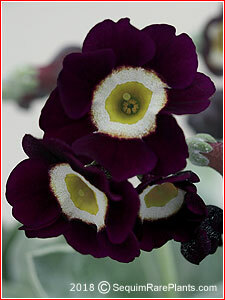 $8.95 Deep reddish-purple, lightening at the edges. 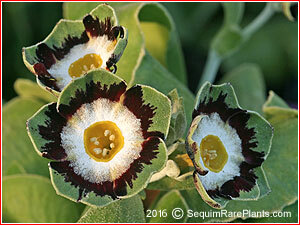 $11.95 A fancy auricula, each of its flowers has a thin, fine edge of gray, with maroon-red petals, and a large white eye. 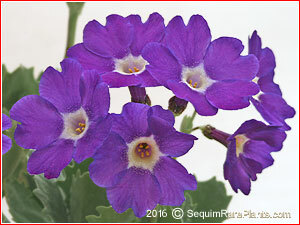 $8.95 Rich purple petals that lighten at their edges. 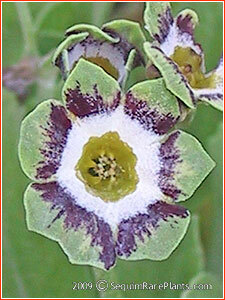 $10.95 Flowers are green at the edges of the petals, and a dark, blackish red, with a ring of white at the eye. $8.95 Creamy light lemon yellow blossoms, named by Herb Dickson. 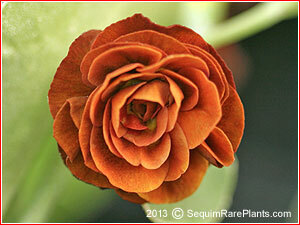 $13.95 Double flowers of cinnamon-brown, orignially from Derek Salt. $9.95 The petals have a green edge and a black base, surrounding a ring of pure white, with the a light yellow inner eye. This beauty grows vigorously. 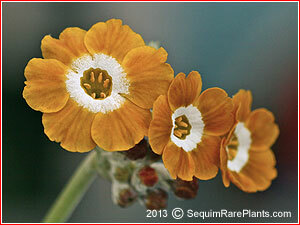 $8.95 'Old Mustard' has medium tan flowers with white eyes. 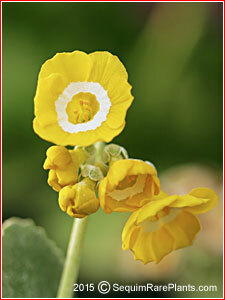 The clusters of flowers come on especially tall stems to eight inches. 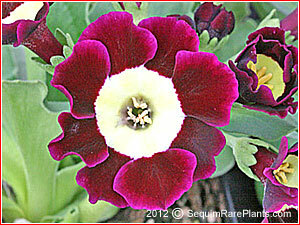 $8.95 The shape of this flower is different from most of these primroses. 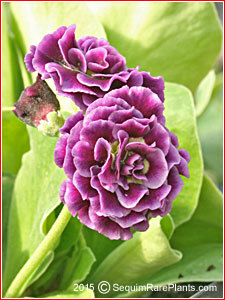 It is long and funnel shaped with a cream center surrounded by an edge of purple tinged green. 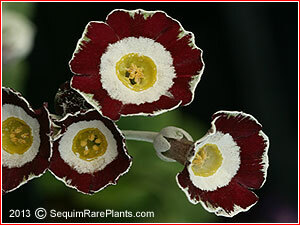 $11.95 'Pegasus' has intense, blood-red flowers that are double. 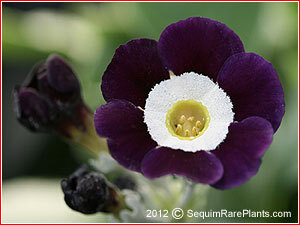 $10.95 A rich, royal purple self with a white eye, and nicely contrasting silvery foliage. $13.95 Double flowers. 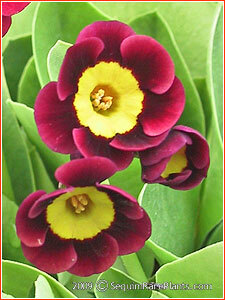 The young flower buds are dark at first, and lighten as they open to a rich, ruby-red. 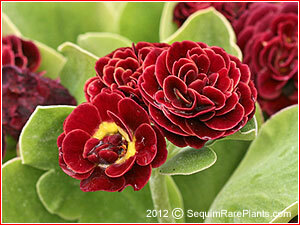 $11.95 A fancy auricula with a red base and a wide, green edge. Limited quantity. 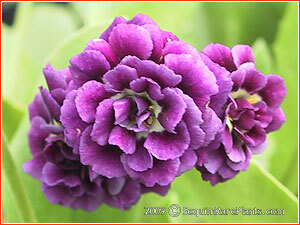 $10.95 Lightly Ruffled petals on full, double heads are reddish-purple, and lighten at their edges. Long blooming with compact growth to five inches. $9.95 Beautifully rounded petals of rich red flowers. The center of each flower is a pure white. $9.95 A delight of rose-red that is paler at the edges of the petals, and with a creamy eye at the center. 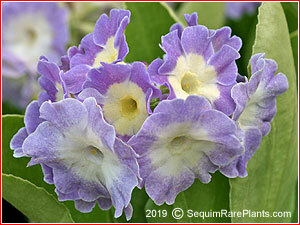 $12.95 The double flowers are creamy white and purplish-red, sometimes with the background color being purplish-red with creamy stripes and other times the reverse, a creamy white background and purplish-red stripes. $11.95 Bright, sunny yellow with a white eye. 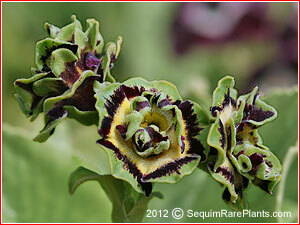 $9.95 An unusual green-edged, double flower on a plant that grows vigorously. 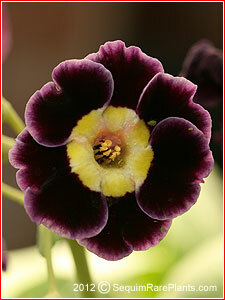 $8.95 This very vigorous plant has very large flowers of rich wine coloring. To emphasize again, it is a strong grower. 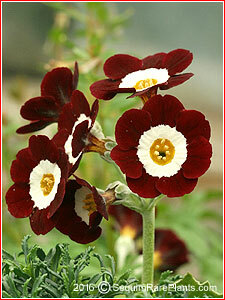 $11.95 Her petals are a rich dark red surrounding a clear white eye. 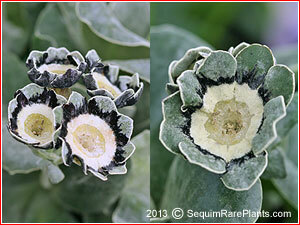 Especially attractive are the leaves with their covering of silvery meal. 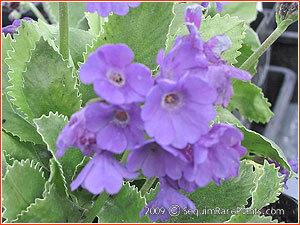 $10.95 Leaves that are gently toothed along the edges, with flowers that are a medium violet. 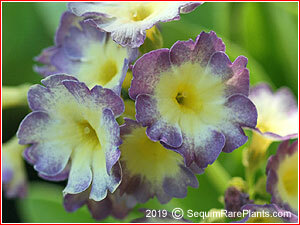 $10.95 Clusters of plum-purple will bloom March into April on stems of 6 to 8 inches. 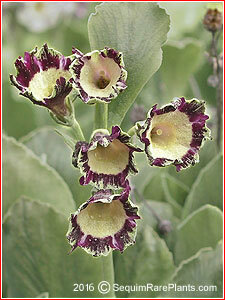 Its attractive, evergreen leaves are deeply notched with soft teeth. For best growth, a site that is partly shaded. 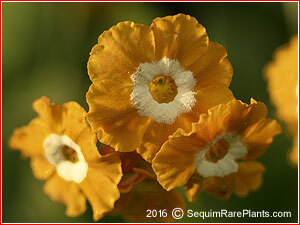 $12.95 Toothed margins of the leaves define this species of primrose. Large white flowers bloom in late March to early May. The leaves are succulent and often dusted in a silvery-gray meal. 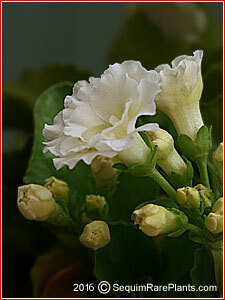 The flowers of 'White Linda Pope' grow to about six inches tall. The leaves are lower, and grow slowly into a widening clump. It is evergreen and is decorative in leaf when not blooming. Limited quantity -- limit of one per order, please. 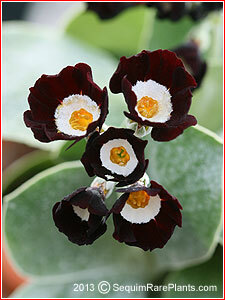 Here are several un-named auriculas. They are propagated by division. 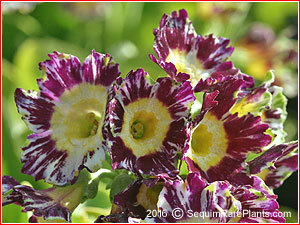 $6.95 Ragged-edged, striped flowers of reddish purple, green and cream. 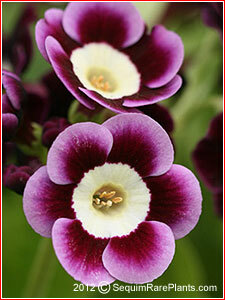 $6.95 The wide creamy center bleeds into a violet purple edge. $6.95 Lavender petals blending into a wide creamy-yellow center. $6.95 Light lavender peatals blending into a creamy center. 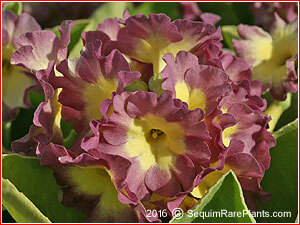 $6.95 Ruffled flowers with a light yellow center, and rose-violet petals. 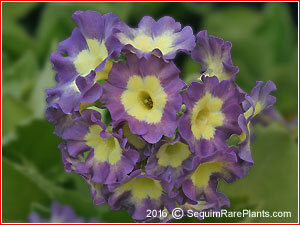 $6.95 Bicolor of light yellow and purple. 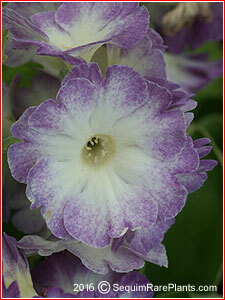 $6.95 Light to medium lavender petals blending into a creamy center, this time with a thrum flower type. 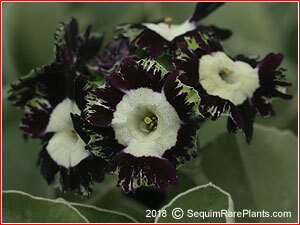 $6.95 A ragged edge of dark reddish purple and green with creamy white in the center. 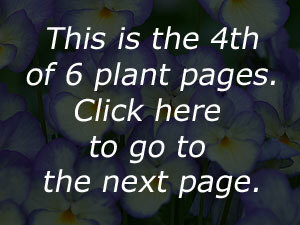 Click here to go to page 5. 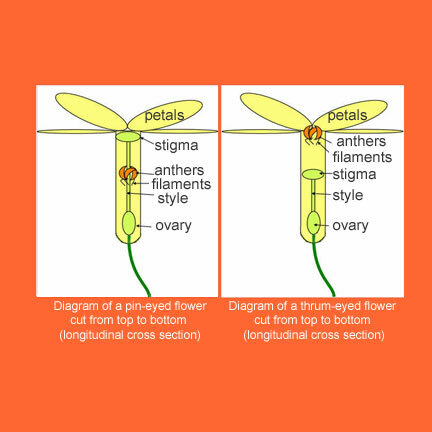 On the left in the picture -- a diagram of a pin-eyed flower, cut from top to bottom (longitudinal cross section), and on the right -- a diagram of a thrum-eyed flower, cut from top to bottom. Insects visit the flowers in search of nectar, which is located at the bottom of the flower tube. This means that only long-tongued insects can actually reach the nectar in the base. An insect such as a Brimstone butterfly (Gonepteryx rhamni), visiting a pin-eyed flower, gets pollen stuck to the middle of its proboscis from the anthers half-way down the flower tube. If it then goes to visit a thrum-eyed flower, the pollen is perfectly positioned to be wiped off on the stigma, in this case, halfway down the flower tube. The reverse is also true. If the butterfly first visits a thrum-eyed flower, pollen is wiped off onto the top of its proboscis as it searches for nectar. 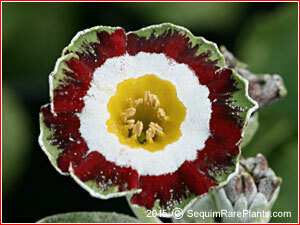 This is then ideally placed to be transferred onto the stigma of the next pin-eyed flower which it visits. Diagram and information are courtesy of countrysideinfo.co.uk.